Here is how to use Alphabet Organizer to create alphabet book or chart: First enter your name and project title. Next choose one of the following options for creating your alphabet organizer: 'words only' template or 'one word and one picture per letter' template. Clicking on any of these options will bring up a list of alphabets. You select a letter (or as many letters as you want) and add up to five words that start with that letter and, if you choose the second template, you will also be provided with the option to add an illustrative picture and short description for the letter. 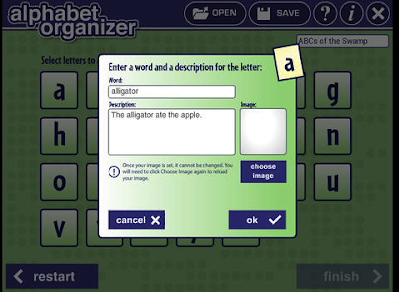 Once done, choose how you want to view your alphabet organizer: either as Word Pages or as Charts and Notes. You can then save a draft of your work, share a copy view email or print it out .